EU leaders have reacted positively to the letter Jeremy Corbyn has sent Theresa May with his proposals to break the Brexit deadlock and avoid a no deal catastrophe for the UK economy. Donald Tusk has suggested that they may provide a way forward that the EU would accept. 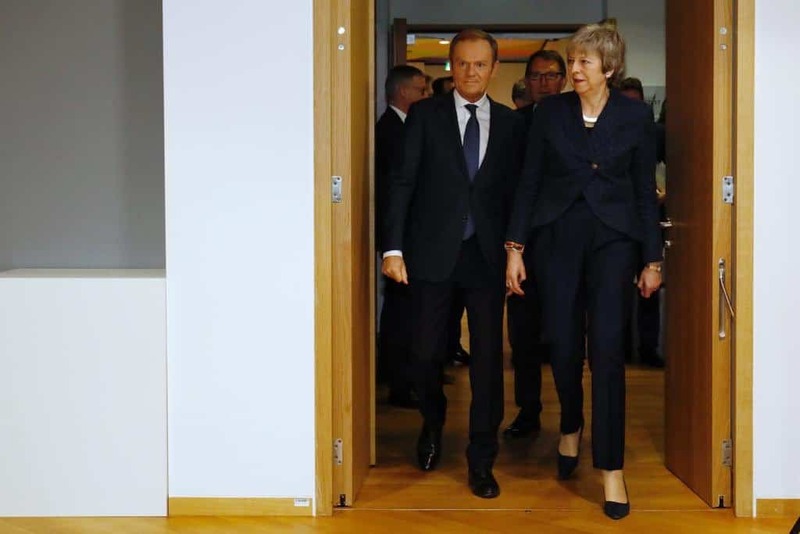 Theresa May and the EU chief looked frosty meeting yestersay at their meeting in Brussels as the Prime Minister looks to deliver the “alternative arrangements” to the backstop in her withdrawal agreement – without explaining what they would be. She is travelling to Dublin to meet Leo Varadkar today but the Irish premier has continuously insisted that Ireland will not allow the hard border that the backstop arrangment prevents. The EU has ruled out reopening the draft EU withdrawal agreement continuously, and there was no signs of any movement after May’s meeting with President of the European Council this week. The PM said brought up his comments earlier in the week when Tusk said there is a special place in hell reserved for those who had promoted Brexit “without even a sketch of a plan” of how to deliver it without causing damage. Corbyn’s letter that the EU is warming to controversially drops some of Labour’s Six Tests for Brexit. It offers a way forward that would not risk losing more jobs and investment or tear up the Northern Ireland peace process by a Brexit with Britain continuing permanenet membership of the Common Market and close alignment to the Single Market of the EU nations to allow the UK to participate in it. 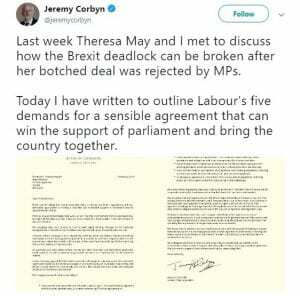 Corbyn offered to back May’s Brexit if she agreed to legislation that would guarantee his proposals with protection for the UK economy, jobs and workers rights. Accepting permanent part of the Customs Union would cross one of Theresa May’s red lines however, and her Conservative colleagues would be unlikely to allow her to accept proposals by the Labour leader. Brexiteers still insisting that Britain would be better off forging new trade deals on its own are unlikley to countenance a compromise which hampers that with Britain continuing frictionless trade with the EU and all the other countries around the globe with trade deals with the EU. The Labour Leader’s letter offered a solution to the Irish border problem while “securing a sensible agreement that can win the support of parliament and bring the country together”. But it has caused a massive backlash from some Labour MPs who accused the Leader of the Opposition of helping Theresa May facilitate Brexit and not mentioning the possibility of a People’s Vote to give the public. 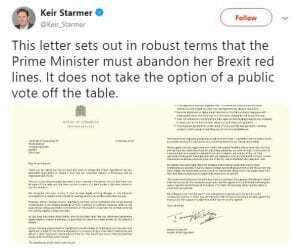 Shadow Brexit Sercretary Keir Starmer insisted that giving the British public was still an option and had not been ruled out. This morning John McDonnell the Shadow Chancellor of the Exchequer told the BBC that the Prime Minister would have a parliamentary majority if she agreed to Labour’s five conditions outlined in Corbyn’s letter. He also confirmed that Labour had not ruled out giving the British public the final say in another referendum.